The Kingdom of Aksum was a trading nation in the area of northern Ethiopia and Eritrea that existed from approximately 100 to 940 CE. Eritrea that existed from approximately 100 to 940 CE. The Aksumite Empire at its height extended across most of present-day Eritrea, northern Ethiopia, western Yemen, southern Saudi Arabia, and Sudan. The capital city of the empire was Aksum, now in northern Ethiopia. By 350, Aksum conquered the Kingdom of Kush. Around 520, King Kaleb sent an expedition to Yemen against the Jewish Himyarite King Dhu Nuwas, who was persecuting the Christian/Aksumite community in his kingdom. These wars may have been Aksum’s swan-song as a great power, but it is also possible that Ethiopia was affected by the Plague of Justinian. Covering parts of what is now northern Ethiopia and Eritrea, Aksum was deeply involved in the trade network between India and the Mediterranean ( Rome, later Byzantium). Aksum’s access to both the Red Sea and the Upper Nile enabled its strong navy to profit in trade between various African (Nubia), Arabian (Yemen), and Indian states. The Kingdom of Aksum is notable for a number of achievements, such as its own alphabet, the Ge’ez alphabet. Under Emperor Ezana, Aksum adopted Christianity, which gave rise to the present-day Ethiopian Orthodox Tewahedo Church and Eritrean Orthodox Tewahdo Church. There exist different hypotheses as to why the empire collapsed, but historians agree that climate changes must have greatly contributed to the end of Aksum. Miaphysitism: A Christological formula of the Oriental Orthodox churches. It holds that in the one person of Jesus Christ, Divinity and Humanity are united in one nature, without separation, without confusion, and without alteration. Plague of Justinian: A pandemic that afflicted the Eastern Roman (Byzantine) Empire, especially its capital, Constantinople, the Sassanid Empire, and port cities around the entire Mediterranean Sea (541–542). One of the greatest plagues in history, this devastating pandemic resulted in the deaths of an estimated 25 to 50 million people. It is generally regarded as the first recorded instance of bubonic plague. Ge’ez: A script used as an abugida (syllable alphabet) for several languages of Ethiopia and Eritrea. It originated as anabjad (consonant-only alphabet) and was first used to write the liturgical language of the Ethiopian Orthodox Tewahedo Church and the Eritrean Orthodox Tewahedo Church. Agaw: An ethnic group inhabiting Ethiopia and neighboring Eritrea. They speak Agaw languages, which belong to the Cushitic branch of the Afro-Asiatic family. They are credited with establishing first settlements in the territory that later became the Kingdom of Aksum. Sabaeans: An ancient people speaking an Old South Arabian language who lived in what is today Yemen, in the southwest of the Arabian Peninsula. For some time, they were believed to have established the Kingdom of Aksum, but historians today reject this claim. Aksum: The capital of the Kingdom of Aksum. The Kingdom of Aksum (or Axum; also known as the Aksumite Empire) was a trading nation in the area of northern Ethiopia and Eritrea that existed from approximately 100 to 940 CE. It grew from the proto-Aksumite Iron Age period around the 4th century BCE to achieve prominence by the 1st century CE, and was a major agent in the commercial route between the Roman Empire and Ancient India. The Aksumite rulers facilitated trade by minting their own Aksumite currency. The state established its hegemony over the declining Kingdom of Kush and regularly entered the politics of the kingdoms on the Arabian Peninsula, eventually extending its rule over the region with the conquest of the Himyarite Kingdom. The Persian Prophet Mani regarded Axum as the third of the four greatest powers of his time after Rome and Persia, with China being the fourth. Aksum was previously thought to have been founded by Sabaeans, an ancient people speaking an Old South Arabian language who lived in what is today Yemen, in the southwest of the Arabian Peninsula. However, most scholars now agree that prior to the arrival of Sabaeans, an African settlement by the Agaw people and other Ethiopian groups had already existed in the territory. Sabaean influence is now thought to have been minor, limited to a few localities, and disappearing after a few decades or a century, perhaps representing a trading or military colony. The Aksumite Empire at its height extended across most of present-day Eritrea, northern Ethiopia, western Yemen, southern Saudi Arabia, and Sudan. The capital city of the empire was Aksum, now in northern Ethiopia. Today a smaller community, the city of Aksum was once a bustling metropolis and cultural and economic center. By the reign of Endubis in the late 3rd century, the empire had begun minting its own currency. It converted to Christianity in 325 or 328 under King Ezana, and was the first state ever to use the image of the cross on its coins. The kingdom used the name “Ethiopia” as early as the 4th century. By 350, Aksum conquered the Kingdom of Kush. Around 520, King Kaleb sent an expedition to Yemen against the Jewish Himyarite King Dhu Nuwas, who was persecuting the Christian/Aksumite community in his kingdom. After several years of military and political struggles, Yemen fell under the rule of Aksumite general Abreha, who continued to promote the Christian faith until his death, not long after which Yemen was conquered by the Persians. According to Munro-Hay these wars may have been Aksum’s swan-song as a great power, with an overall weakening of Aksumite authority and over-expenditure in money and manpower. It is also possible that Ethiopia was affected by the Plague of Justinian around this time, a disease thought to be the first recorded instance of bubonic plague. Covering parts of what is now northern Ethiopia and Eritrea, Aksum was deeply involved in the trade network between India and the Mediterranean (Rome, later Byzantium), exporting ivory, tortoise shell, gold, and emeralds, and importing silk and spices. Aksum’s access to both the Red Sea and the Upper Nile enabled its strong navy to profit in trade between various African (Nubia), Arabian (Yemen), and Indian states. The empire traded with Roman traders as well as with Egyptian and Persian merchants. 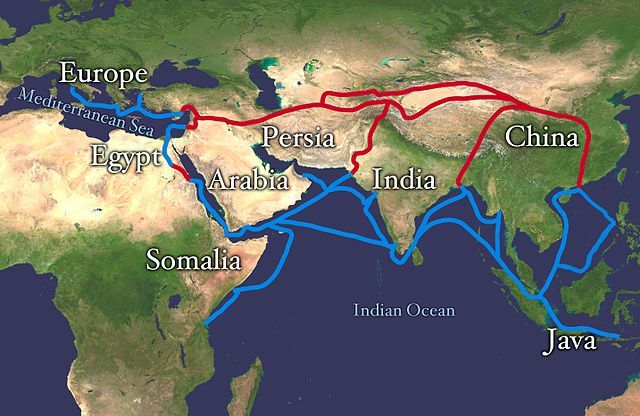 Extent of Silk Route/Silk Road: The economically important northern Silk Road and southern Spice (Eastern) trade routes. The sea routes around the horn of Arabia and the Indian sub-continent were Aksum’s specialty for nearly a millennium. The main exports of Aksum were agricultural products. The land was fertile during the time of the Aksumites, and the principal crops were grains such as wheat and barley. The people of Aksum also raised cattle, sheep, and camels. Wild animals were hunted for ivory and rhinoceros horns. The empire was rich with gold and iron deposits, and salt was an abundant and widely traded mineral. Aksum benefited from a major transformation of the maritime trading system that linked the Roman Empire and India. Starting around 100 BCE, a route from Egypt to India was established, making use of the Red Sea and using monsoon winds to cross the Arabian Sea directly to southern India. Aksum was ideally located to take advantage of the new trading situation. Adulis soon became the main port for the export of African goods, such as ivory, incense, gold, and exotic animals. Slaves were also traded along the same routes. During the 2nd and 3rd centuries, the Kingdom of Aksum continued to expand their control of the southern Red Sea basin. A caravan route to Egypt, which bypassed the Nile corridor entirely, was established. Aksum succeeded in becoming the principal supplier of African goods to the Roman Empire. A gold coin of the Aksumite king Ousas, specifically a one third solidus, diameter 17 mm, weight 1.50 gm. The Aksumite Empire was one of the first African polities economically and politically ambitious enough to issue its own coins, which bore legends in Ge’ez and Greek. The Aksumite Empire is notable for a number of achievements, such as its own alphabet, the Ge’ez alphabet, which was eventually modified to include vowels. 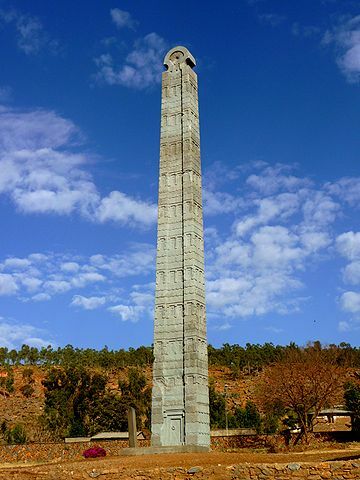 Furthermore, in the early times of the empire, giant obelisks to mark emperors’ (and nobles’) tombs (underground grave chambers) were constructed, the most famous of which is the Obelisk of Aksum. Under Emperor Ezana, Aksum adopted Christianity in place of its former polytheistic and Judaic religions. This gave rise to the present day Ethiopian Orthodox Tewahedo Church (only granted autonomy from the Coptic Church in 1953), and Eritrean Orthodox Tewahdo Church (granted autonomy from the Ethiopian Orthodox church in 1993). Since the schism with orthodoxy following the Council of Chalcedon (451), it has been an important Miaphysite church, and its scriptures and liturgy continue to be in Ge’ez. The Stelae (hawilt/hawilti in local languages) are perhaps the most identifiable part of the Aksumite legacy. These stone towers served to mark graves and represent a magnificent multi-storied palace. They are decorated with false doors and windows in typical Aksumite design. The Stelae have most of their mass out of the ground, but are stabilized by massive underground counter-weights. The stone was often engraved with a pattern or emblem denoting the king’s or the noble’s rank. Eventually, the Islamic Empire took control of the Red Sea and most of the Nile, forcing Aksum into economic isolation. Northwest of Aksum, in modern-day Sudan, the Christian states of Makuria and Alodia lasted until the 13th century before becoming Islamic. Aksum, isolated, nonetheless still remained Christian. After a second golden age in the early 6th century, the empire began to decline, eventually ceasing its production of coins in the early 7th century. Around the same time, the Aksumite population was forced to go farther inland to the highlands for protection, abandoning Aksum as the capital. Arab writers of the time continued to describe Ethiopia (no longer referred to as Aksum) as an extensive and powerful state, although it had lost control of most of the coast and its tributaries. While land was lost in the north, it was gained in the south, and Ethiopia still attracted Arab merchants. The capital was moved to a new location, currently unknown, though it may have been called Ku’bar or Jarmi. There exist different hypotheses as to why the empire collapsed, but historians agree that climate changes must have greatly contributed to the end of Aksum. As international profits from the exchange network declined, Aksum lost its ability to control its own raw material sources, and that network collapsed. The already persistent environmental pressure of a large population to maintain a high level of regional food production had to be intensified. The result was a wave of soil erosion that began on a local scale circa 650 and attained catastrophic proportions after 700. Presumably, complex socio-economic inputs compounded the problem. These are traditionally reflected in declining maintenance, deterioration and partial abandonment of marginal crop land, shifts to destructive pastoral exploitation, and eventual wholesale and irreversible land degradation. This syndrome was possibly accelerated by an apparent decline in rainfall reliability beginning in 730–760, with the presumed result that an abbreviated modern growing season was reestablished during the 9th century. From the Middle Ages until when Europeans colonized the territory of today’s Somalia, the region was never dominated by a centralized empire, and instead witnessed the development and decline of several powerful trading sultanates whose cultures were deeply rooted in Islam. During the Middle Ages, Somalia’s territory witnessed the emergence and decline of several powerful sultanates that dominated the regional trade. At no point was the region centralized as one state, and the development of all the sultanates was linked to the central role that Islam played in the area since the 7th century. The Sultanate of Mogadishu was an important trading empire that lasted from the 10th century to the 16th century. It maintained a vast trading network, dominated the regional gold trade, minted its own Mogadishu currency, and left an extensive architectural legacy in present-day southern Somalia. The Ajuran Sultanate ruled over large parts of the Horn of Africa between the 13th and late 17th centuries. Through a strong centralized administration and an aggressive military stance towards invaders, it successfully resisted an Oromo invasion from the west and a Portuguese incursion from the east. It left an extensive architectural and engineering legacy. 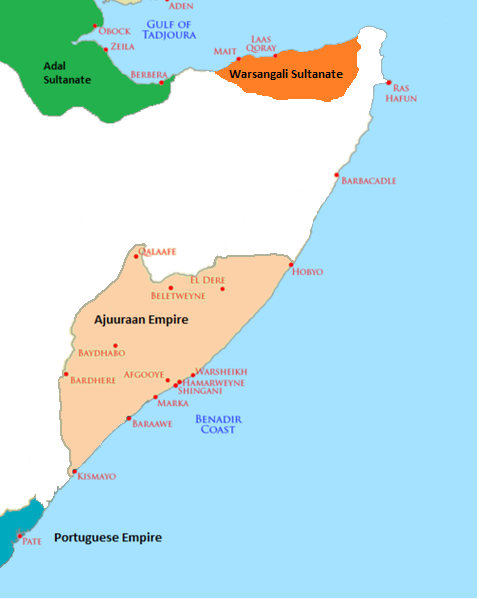 The Warsangali Sultanate was a kingdom centered in northeastern and in some parts of southeastern Somalia. It was one of the largest sultanates ever established in the territory. The Sultanate of Ifat was a medieval Muslim Sultanate in the Horn of Africa. Led by the Walashma dynasty, it was centered in the ancient cities of Zeila and Shewa. The Kingdom ruled over parts of what are now eastern Ethiopia, Djibouti, and northern Somalia. Ifat first emerged in the 13th century, when Sultan Umar Walashma conquered the Sultanate of Showa in 1285. The Adal Sultanate or Kingdom of Adal was founded after the fall of the Sultanate of Ifat. It flourished from around 1415 to 1577.
the colonial control of Europeans in the 19th century. hijra: The migration or journey of the Islamic prophet Muhammad and his followers from Mecca to Yathrib, later renamed Medina, in 622 CE. In May 622 CE, after being warned of a plot to assassinate him, Muhammad secretly left his home in Mecca to emigrate to Yathrib, 320 kilometers (200 miles) north of Mecca, along with his companion, Abu Bakr. Zeila: A port city in northwestern Somali. It evolved into an early Islamic center with the arrival of Muslims shortly after the hijra. By the 9th century it was the capital of the Ifat Sultanate and a major port for its successor state the Adal Sultanate. It would attain its height of prosperity a few centuries later, in the 16th century. The city subsequently came under Ottoman and British protection in the 18th century. Berbers: An ethnic group indigenous to North Africa. They are distributed in an area stretching from the Atlantic Ocean to the Siwa Oasis in Egypt, and from the Mediterranean Sea to the Niger River. Since the Muslim conquest of North Africa in the 7th century, a large number inhabiting the Maghreb have acquired different degrees of knowledge of the various languages of North Africa. During the Middle Ages, Somalia’s territory witnessed the emergence and decline of several powerful sultanates that dominated the regional trade. At no point was the region centralized as one state, and the development of all the sultanates was linked to the central role that Islam played in the area since the 7th century. Islam was introduced to the northern Somali coast from the Arabian Peninsula early on, shortly after the hijra (also hegira), or the journey of the Islamic prophet Muhammad and his followers from Mecca to Yathrib, later renamed Medina, in 622 CE. The oldest mosque in the city of Zeila, a major port/trading center, dates to the 7th century. In the late 9th century, Muslims were living along the northern Somali seaboard, and evidence suggests that Zeila was already the headquarters of a Muslim sultanate in the 9th or 10th century. According to I.M. Lewis, the polity was governed by local dynasties consisting of Somalized Arabs or Arabized Somalis, who also ruled over the Sultanate of Mogadishu in the Benadir region to the south. The Sultanate of Mogadishu was an important trading empire that lasted from the 10th century to the 16th century. It rose as one of the pre-eminent powers in the Horn of Africa over the course of the 12th to 14th centuries, before becoming part of the expanding Ajuran Empire. The Mogadishu Sultanate maintained a vast trading network, dominated the regional gold trade, minted its own Mogadishu currency, and left an extensive architectural legacy in present-day southern Somalia. Its first dynasty was established by Sultan Fakr ad-Din. This ruling house was succeeded by the Muzaffar dynasty, and the kingdom subsequently became closely linked with the Ajuran Sultanate. For many years, Mogadishu stood as the pre-eminent city in what is known as the Land of the Berbers, which was the medieval Arab term for the Somali coast. Contemporary historians suggest that the Berbers were ancestors of the modern Somalis. During his travels, Ibn Sa’id al-Maghribi (1213–1286) noted that the city had already become the leading Islamic center in the region. By the time of the Moroccan traveler Ibn Battuta’s appearance on the Somali coast in 1331, the city was at the zenith of its prosperity. He described Mogadishu as “an exceedingly large city” with many rich merchants that was famous for its high quality fabric that it exported to Egypt, among other places. from the west and a Portuguese incursion from the east during the Gaal Madow and the Ajuran-Portuguese wars. Trading routes dating from the ancient and early medieval periods of Somali maritime enterprise were strengthened or re-established, and foreign trade and commerce in the coastal provinces flourished, with ships sailing to and coming from many kingdoms and empires in East Asia, South Asia, Europe, the Near East, North Africa, and East Africa. The Ajuran Sultanate left an extensive architectural legacy, being one of the major medieval Somali powers engaged in castle and fortress building. Many of the ruined fortifications dotting the landscapes of southern Somalia today are attributed to the Ajuran Sultanate’s engineers. During the Ajuran period, many regions and people in the southern part of the Horn of Africa converted to Islam because of the theocratic nature of the government. The royal family, the House of Garen, expanded its territories and established its hegemonic rule through a skillful combination of warfare, trade linkages, and alliances. As a hydraulic empire, the Ajuran monopolized the water resources of the Shebelle and Jubba rivers. It also constructed many of the limestone wells and cisterns of the state that are still in use today. The rulers developed new systems for agriculture and taxation, which continued to be used in parts of the Horn of Africa as late as the 19th century. The tyrannical rule of the later Ajuran rulers caused multiple rebellions to break out in the sultanate, and at the end of the 17th century the Ajuran state disintegrated into several successor kingdoms and states, the most prominent being the Geledi Sultanate. The Warsangali Sultanate was a kingdom centered in northeastern and in some parts of southeastern Somalia. It was one of the largest sultanates ever established in the territory, and, at the height of its power, included the Sanaag region and parts of the northeastern Bari region of the country, an area historically known as Maakhir or the Maakhir Coast. The Sultanate was founded in the late 13th century in northern Somalia by a group of Somalis from the Warsangali branch of the Darod clan. It survived until the British colonization of the region in the 19th century. Already in the classical (ancient) period, the Somali city-states of Mosylon, Opone, Malao, Sarapion, Mundus, Essina, and Tabae developed a lucrative trade network connecting with merchants from Phoenicia, Ptolemic Egypt, Greece, Parthian Persia, Sheba, Nabataea, and the Roman Empire. They used the ancient Somali maritime vessel known as the beden to transport their cargo. The Sultanate of Ifat was a medieval Muslim Sultanate in the Horn of Africa. Led by the Walashma dynasty, it was centered in the ancient cities of Zeila and Shewa. The sultanate ruled over parts of what are now eastern Ethiopia, Djibouti, and northern Somalia. Ifat first emerged in the 13th century, when Sultan Umar Walashma (or his son Ali, according to another source) is recorded as having conquered the Sultanate of Showa in 1285. Historian Taddesse Tamrat explains Sultan Umar’s military acts as an effort to consolidate the Muslim territories in the Horn of Africa in much the same way as Emperor Yekuno Amlak was attempting to consolidate the Christian territories in the highlands during the same period. These two states inevitably came into conflict over Shewa and territories further south. A lengthy war ensued, but the Muslim sultanates of the time were not strongly unified. Ifat was finally defeated by Emperor Amda Seyon I of Ethiopia in 1332. Despite this setback, the Muslim rulers of Ifat continued their campaign. The Ethiopian emperor branded the Muslims of the surrounding area “enemies of the Lord” and invaded Ifat in the early 15th century. After much struggle, Ifat’s troops were defeated. Ifat eventually disappeared as a distinct polity following the Conquest of Abyssinia led by Ahmad ibn Ibrahim al-Ghazi and the subsequent Oromo migrations into the area. Its name is preserved in the modern-day Ethiopian district of Yifat, situated in Shewa. The Adal Sultanate or Kingdom of Adal was founded after the fall of the Sultanate of Ifat. It flourished from around 1415 to 1577. The sultanate was established predominately by local Somali tribes, as well as Afars, Arabs, and Hararis. At its height, the polity controlled large parts of Somalia, Ethiopia, Djibouti, and Eritrea. During its existence, Adal had relations and engaged in trade with other polities in northeast Africa, the Near East, Europe, and South Asia. Many of the historic cities in the Horn of Africa, such as Abasa and Berbera, flourished under its reign, with courtyard houses, mosques, shrines, walled enclosures, and cisterns. Adal attained its peak in the 14th century, trading in slaves, ivory, and other commodities with Abyssinia and kingdoms in Arabia through its chief port of Zeila. Following the Middle Ages and Early Modern period, Arab sultanates continued to dominate the region, until it fell under the colonial control of Europeans in the 19th century. The Sultanate of the Geledi ruled parts of the Horn of Africa during the late 17th century and 19th century. The Sultanate was governed by the Gobroon Dynasty. It was eventually incorporated into Italian Somaliland in 1908, and ended with the death of Osman Ahmed in 1910. The Majeerteen Sultanate was a Somali Sultanate centered in the Horn of Africa. Ruled by Boqor Osman Mahamuud during its golden age, it controlled much of northern and central Somalia in the 19th and early 20th centuries. The polity had all of the organs of an integrated modern state and maintained a robust trading network. It also entered into treaties with foreign powers and exerted strong centralized authority on the domestic front. In late 1889, Boqor Osman entered into a treaty with Italy, making his kingdom a protectorate known as Italian Somaliland. the Sultanate of Hobyo, in present-day northeastern and central Somalia and eastern Ethiopia, was established in the 1870s by Yusuf Ali Kenadid, cousin of Boqor Osman Mahamuud. As with the Majeerteen Sultanate, the Sultanate of Hobyo exerted a strong centralized authority during its existence, and possessed all of the organs and trappings of an integrated modern state: a functioning bureaucracy, a hereditary nobility, titled aristocrats, a state flag, and a professional army. In late 1888, Sultan Kenadid entered into a treaty with the Italians, making his realm an Italian protectorate, but the sultanate eventually dissolved in 1926. Following the ancient kingdom of D’mt and the medieval empire of Aksum, some of current Ethiopia’s territory was dominated by the Christian Ethiopian Empire established by the Zagwe dynasty in the 12th century, and later ruled by the Solomonic dynasty until the 20th century. The first kingdom thought to have existed in today’s Ethiopia was the kingdom of D’mt, with its capital at Yeha, where a Sabaean-style temple was built around 700 BCE. It rose to power around the 10th century BCE, but little is certain about its development and decline. Aksum is the first verifiable kingdom of great power to rise in the region. It was a trading empire in the area of northern Ethiopia and Eritrea, and existed approximately from 100 to 940 CE. An Agaw lord named Mara Takla Haymanot founded the Zagwe dynasty in 1137. The new dynasty established its capital at Roha and controlled a smaller area than the Aksumites, with its core in the Lasta region. The Zagwe seem to have ruled over a mostly peaceful state with a flourishing urban culture. Around 1270, a new dynasty was established in the Abyssinian highlands under Yekuno Amlak. A 14th century legend was created to legitimize the Solomonic dynasty, under which the chief provinces became Tigray (northern), what is now Amhara (central), and Shewa (southern). Towards the close of the 15th century, the Portuguese missions into Ethiopia began, and Pêro da Covilhã arrived in Ethiopia in 1490. In 1507, an Armenian named Matthew was sent by the emperor to the king of Portugal to request his aid against the Muslims. In 1520, a Portuguese fleet, with Matthew on board, entered the Red Sea in compliance with this request. Between 1528 and 1543, wars with Somali sultanates dominated the Ethiopian Empire. With the support of the Portuguese, Ethiopia emerged victorious from the conflict. In the 18th century, the so-called Zemene Mesafint (Era of the Princes) began. It was a period in Ethiopian history when the country was divided into several regions with no effective central authority. It ended in the mid-19th century, and Ethiopia was one of few territories not colonized by Europeans. the Zagwe dynasty: A historical kingdom in present-day northern Ethiopia. Centered at Lalibela, it ruled large parts of the territory from approximately 900 to 1270, when the last Zagwe King Za-Ilmaknun was killed in battle by the forces of Yekuno Amlak. Zemene Mesafint: Known also as Era of the Princes, was a period (18th century to mid-19th century) in Ethiopian history when the country was divided into several regions with no effective central authority. It was a period in which the emperors were reduced to figureheads confined to the capital city of Gondar. Fasil Ghebbi: A fortress-city within Gondar, Ethiopia. It was founded in the 17th and 18th centuries by Emperor Fasilides (Fasil) and was the home of Ethiopia’s emperors. Its unique architecture shows diverse influences, including Nubian styles. the Solomonic dynasty: The former ruling imperial house of the Ethiopian Empire. Its members claim patrilineal descent from King Solomon of Israel and the Queen of Sheba. Yekuno Amlak claimed direct male-line descent from the old Aksumite royal house that the Zagwes had replaced on the throne. It continued to rule Ethiopia with few interruptions until 1974, when the last emperor, Haile Selassie I, was deposed. Aksum: A trading nation in Eritrea and Northern Ethiopia Tigray that existed approximately from 100 to 940 CE. It grew from the proto-Aksumite Iron Age period c. the 4th century BCE to achieve prominence by the 1st century CE, and was a major agent in the commercial route between the Roman Empire and Ancient India. Hatata: A 1667 ethical philosophical treatise by Ethiopian philosopher Zera Yacob. The philosophy is theistic in nature and came during a period when African philosophical literature was significantly oral in character. It has often been compared by scholars to Descartes’ Discours de la methode (1637). Yacob wrote his treatise as an investigation of the light of reason. Yacob is most noted for this philosophy surrounding the principle of harmony. whether D’mt ended as a civilization before Aksum’s (its one possible successor) early stages, evolved into the Aksumite state, or was one of the smaller states united in the Aksumite kingdom possibly around the beginning of the 1st century. Roman Empire and Ancient India. About 1000 (presumably c. 960, though the date is uncertain), a non-Christian female ruler conquered the area. Little is known about this episode, but the later Solomonic Dynasty used the legend of a princess named Yodit to legitimize its rule. At one point during the next century, the last of Yodit’s successors were overthrown by an Agaw lord named Mara Takla Haymanot, who founded the Zagwe dynasty in 1137—the year that marks the beginning of the Ethiopian Empire, known also as Abyssinia. The new Zagwe dynasty established its capital at Roha (also called Lalibela), where they built a series of monolithic churches. The architecture of the Zagwe shows a continuation of earlier Aksumite traditions. The Zagwe dynasty controlled a smaller area than the Aksumites, with its core in the Lasta region. The Zagwe seem to have ruled over a mostly peaceful state with a flourishing urban culture. Unlike the Aksumites, they were very isolated from the other Christian nations, although they did maintain a degree of contact through Jerusalem and Cairo. Later, as the Crusades were dying out in the early 14th century, the Ethiopian King Wedem Ar’ad dispatched a thirty-man mission to Europe, where they traveled to Rome to meet the Pope and then, since the Medieval Papacy was in schism, they traveled to Avignon to meet the Antipope. During this trip, the Ethiopian mission also traveled to France, Spain, and Portugal in the hopes of building an alliance against the Muslim states that threatened Ethiopia’s existence. Around 1270, a new dynasty was established in the Abyssinian highlands under Yekuno Amlak, who deposed the last of the Zagwe kings and married one of his daughters. According to legends, the new dynasty were male-line descendants of Aksumite monarchs. The 14th century legend was created to legitimize the Solomonic dynasty, under which the chief provinces became Tigray (northern), what is now Amhara (central), and Shewa (southern). The seat of government, or rather of overlordship, was usually in Amhara or Shewa, and the ruler exacted tribute, when he could, from the other provinces. At the time, Ethiopia engaged in military reforms and imperial expansion that left it dominating the Horn of Africa, especially under the rule of Amda Seyon I (1314–44). Artistic and literary advancement of the period came together with a decline in urbanization, as the Solomonic emperors did not have a fixed capital but rather moved around the empire in mobile camps. Towards the close of the 15th century, the Portuguese missions into Ethiopia began. A belief had long prevailed in Europe of the existence of a Christian kingdom in the far east whose monarch was known as Prester John, and various expeditions had been sent to find it. Among others engaged in this search was Pêro da Covilhã, who arrived in Ethiopia in 1490. Da Covilhã remained in the country, but in 1507 an Armenian named Matthew was sent by the emperor to the king of Portugal to request his aid against the Muslims. In 1520, a Portuguese fleet, with Matthew on board, entered the Red Sea in compliance with this request, and an embassy from the fleet visited the emperor, Lebna Dengel, and remained in Ethiopia for about six years. One of this embassy was Father Francisco Álvares, who wrote one of the earliest accounts of the country. Lebna Dengel, nəgusä nägäst (emperor) of Ethiopia and a member of the Solomonic dynasty. Portrait by Cristofano dell’Altissimo, c. 1552-1568, Uffizi, Florence. The Solomonic dynasty was a bastion of Judaism and later of Ethiopian Orthodox Christianity. It is considered to have ruled Ethiopia in the 10th century BCE. Records of the dynasty’s history were reported to have been maintained by the Ethiopian Orthodox monasteries to near antiquity. However, if such records existed, most were lost as a result of the destruction of Orthodox monasteries. The Dynasty re-established itself in 1270 CE, when when Yekuno Amlak overthrew the last ruler of the Zagwe dynasty. Between 1528 and 1540, armies of Muslims, under the Imam Ahmad ibn Ibrihim al-Ghazi, entered Ethiopia from the low country to the southeast and overran the Abyssinian Kingdom, obliging the Emperor to take refuge in the mountains. The ruler turned to the Portuguese again. João Bermudes, a subordinate member of the mission of 1520, was sent to Lisbon, although it is not know what his specific role was. In response to Bermudes’s message, a Portuguese fleet under the command of Estêvão da Gama was sent from India and arrived at Massawa in 1541. Under the command of Cristóvão da Gama, younger brother of the admiral, the Portuguese and local troops were initially successful against the enemy. However, they were subsequently defeated at the Battle of Wofla (1542), and their commander was captured and executed. Nonetheless, in 1543, Al-Ghazi was shot and killed in the Battle of Wayna Daga, and his forces were totally routed. Following the victory, quarrels arose between the emperor and Bermudes, who now urged the emperor to publicly profess his obedience to Rome. The emperor refused, and Bermudes was obliged to leave. who had accompanied or followed the Gama expedition, were expelled and the native religion restored to official status. Fasilides made Gondar his capital in 1636 and built a castle there, which would grow into the castle complex known as the Fasil Ghebbi, or Royal Enclosure. During this time, Ethiopian philosophy flourished, with philosophers Zera Yacob and Walda Heywat leading the way. Yaqob is known for his treatise on religion, morality, and reason, known as Hatata. The Royal Enclosure (Fasil Ghebbi) and Gondar: Emperor Fasilides made Gondar his capital and built a castle there, which would grow into the castle complex known as the Fasil Ghebbi, or Royal Enclosure. Fasilides also constructed several churches in Gondar, many bridges across the country, and expanded the Church of Our Lady Mary of Zion in Aksum. In the 18th century, the so-called Zemene Mesafint (Era of the Princes) began. It was a period in Ethiopian history when the country was divided into several regions with no effective central authority. The emperors were reduced to little more than figureheads confined to the capital city of Gondar. Historians debate what triggered Zemene Mesafint, pointing to various events ranging from 1706 to 1769 as the beginning of the era. A religious conflict between settling Muslims and traditional Christians, between nationalities they represented, and between feudal lords dominated the region at the time. The power lay ever more openly in the hands of the great nobles and military commanders. Bitter religious conflicts contributed to hostility toward foreign Christians and Europeans; they persisted into the 20th century and were a factor in Ethiopia’s isolation until the mid-19th century, when the first British mission was sent in 1805 to conclude an alliance with Ethiopia and obtain a port on the Red Sea in case France conquered Egypt. This isolation was pierced by very few European travelers. The first years of the 19th century were disturbed by fierce campaigns between Ras Gugsa of Begemder and Ras Wolde Selassie of Tigray, who fought over control of the figurehead emperor Egwale Seyon. Wolde Selassie was eventually the victor and practically ruled the whole country until his death in 1816 at the age of eighty. Dejazmach Sabagadis of Agame succeeded Wolde Selassie in 1817, through force of arms, to become warlord of Tigre. Under the emperors Tewodros II (1855–1868), Yohannes IV (1872–1889), and Menelek II (1889–1913), the empire began to emerge from its isolation. Under Emperor Tewodros II, Zemene Mesafint was brought to an end. Ethiopia was never colonized by a European power, but was occupied by Italians in 1936. However, several colonial powers had interests in and designs on Ethiopia in the context of the 19th century colonization of Africa.